Not only can fungal toenails become painful, ugly and embarrassing but can become thick, , discolored, deformed, brittle, foul smelling, detached from the nail bed, ingrown, infected, difficult to trim and can destroy socks or nylons. 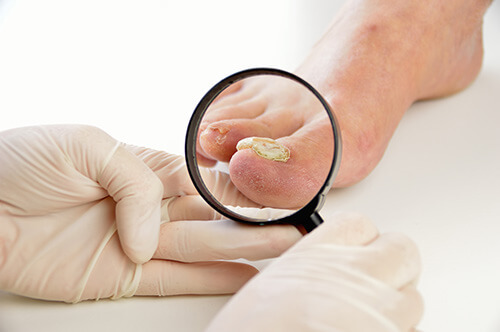 Fungal infections in toenails are caused by the same fungus that causes an athlete’s foot infection. This fungus is always lurking around our feet and will take any opportunity it can to infect a toenail. Unfortunately, once a toenail becomes infected with fungus it often gets worse over time, eating away at your healthy nails, often spreading to other toenails or even other family members. Toenail fungus can also be difficult to treat and no treatment can give you immunity to the fungus or prevent it from ever recurring, other than permanent toenail removal, which is sometimes necessary. • Permanent removal of a terribly painful, deformed, fungal toenail. If you are having problems with toenail fungus then an appointment is necessary with Dr. Silver at the Westwood Foot Clinic in Golden Valley, MN to determine the ideal treatment to get your toenails looking and feeling healthy again.